The Metron dashboard has several advantages over conventional SIEM tools, including flexibility, and the single pane of glass approach that displays all of the data on the same screen, requiring no jumping from console to console to gather the information. HCP supports two types of messages: metadata and alerts. By convention there should be one panel per metadata telemetry and one panel that is a "catch all" panel for alerts. The Snort panels are a good example of these two panel types. 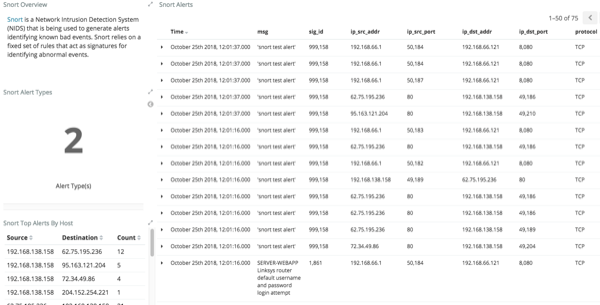 However, the Snort alerts panel only lists alerts from Snort because the default Metron dashboard contains only one data source that produces alerts. When HCP parses the telemetry data on ingest, it extracts and normalizes different parts of the message into a standard Metron JSON. Standardizing and normalizing field names and format allows HCP to search different telemetry messages with a single query. The first telemetry type that HCP supports is metadata messages. Metadata messages are parsed enriched messages in the JSON format. The second telemetry type that HCP supports is alerts telemetries. Alerts telemetries come from IDS sensors like Snort or mixed telemetries like application logs that contain some metadata and some alert messages. While it is possible to set up a new panel for each alert telemetry, it is more desirable to set up a single panel that contains all of the alerts. This guarantees that the query will pull in alerts from multiple telemetries (even mixed mode telemetries that have some metadata and some alerts associated with them). You can then set up a detailed table containing only the alerts. To set telemetry as alert you need to set is_alert = true. This is already set up for HCP under the "Alerts" table. The fields displayed for each alerts table can be customized. Ideally you want the fields of most importance (as well as the standard fields that telemetries are correlated on) to be displayed. The following table contains a description of each of the Kibana components in the Metron dashboard. You can use the area chart panel for stacked timelines for which you want to see the total. Use the data table panel to provide a detail breakdown, in tabular format, of the results of a composed aggregation. You can generate a data table from many other charts by clicking the grey bar at the bottom of the chart. A detailed message panel displays the raw data from your search query. When you submit a search query, the 500 most recent documents that match the query are listed in the Documents table which is displayed in the center of the Discover window. A list of all of the fields associated with a selected index pattern. This list is displayed on the left side of the Discover window. A pie chart is a circular statistical graphic that is ideal for displaying the parts of some whole. The tile map panel type displays a map populated with your search results. This panel type requires an Elasticsearch geo_point field that is mapped as type:geo_point with latitude and longitude coordinates. You can use the vertical bar chart panel to display histograms. Histogram panels represent ingest rates for each individual telemetry. By convention, you should set up one for each type.